We can deliver your new wheeled lawn vacuum to anywhere in Ireland. Billy Goat professional leaf collectors for sale in Ireland. 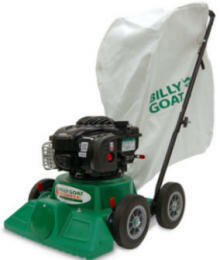 Billy Goat leaf vacuums for sale in Northern Ireland are the market leader in leaf and debris collection. They feature both home owner models and professional models suitable for collecting leaves and debris on large areas. 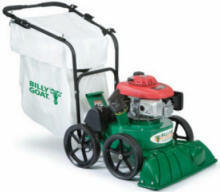 Billy Goats all inclusive line of leaf, litter and debris vacuums for residential and commercial properties offer clean up solutions for wide ranging applications. From car parks, city streets, pavements and parks or municipal areas to school campuses and industrial applications, Billy Goat has been setting the standard for property clean-up for more than 45 years. All Billy Goat vacuums can be fitted with an optional 'wander hose' which allows the user to get in around hard to reach places like flowerbeds, up the side of buildings and under summer seats etc. The full Billy Goat range is available from AM Rentals in Northern Ireland to customers all over Ireland, North and South. We can arrange delivery of your brand new leaf vacuum to anywhere in Ireland, call us today for a delivery quote. Leaf vacuums for sale Northern Ireland - Telephone. Newry 028 302 66665 / From ROI 0044 28 302 66665. 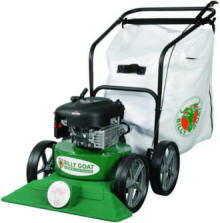 Sales of Billy Goat vacuums, Stihl blowers, Husqvarna leaf blowers and Tanaka blowers. Telephone us at Newry 028 (from ROI 0044 28) 302 66665.